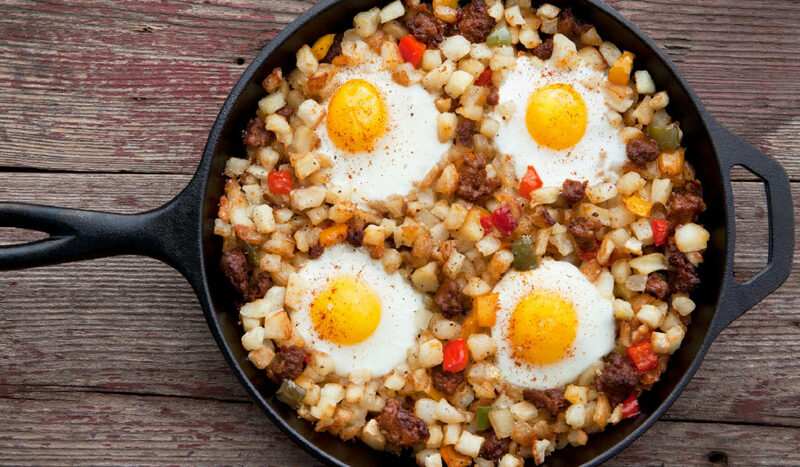 This Food Club® skillet egg hash is the #bestbreakfast ever. 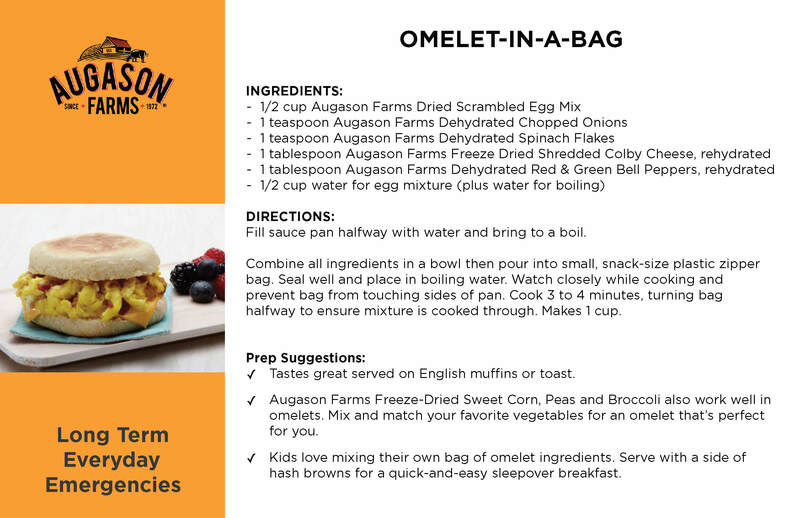 Start your day the right way with this scrumptious recipe. Start be heating a large cast iron skillet with olive oil over medium to high heat. Chop your potatoes to small cubes, and add into the skillet. Add salt and pepper and cook until they are cooked halfway through, about 7-9 minutes. Next, add in the onion and cook for another 3-5 minutes. Be sure to stir occasionally. Then add in the remaining ingredients. Stir in sausage, bell peppers, garlic and red pepper flakes. Reduce to low heat and continue cooking until the potatoes are cooked all the way through. Leave the skillet on low heat and crack eggs over the top. Let them sit over the heated ingredients until they are cooked to your liking. If you prefer a less runny yolk, you can fry the eggs and add them at the end. Add salt and pepper until seasoned. Serve in the skillet on a heat safe counter or hot pad. Toast the rainbow and add some color to your morning with this impressive spread. Take your chosen loaf, or pre-sliced pieces and spread your cream cheese evenly across all five pieces. Thinly slice your chosen fruits and add them over the top of the cream cheese. 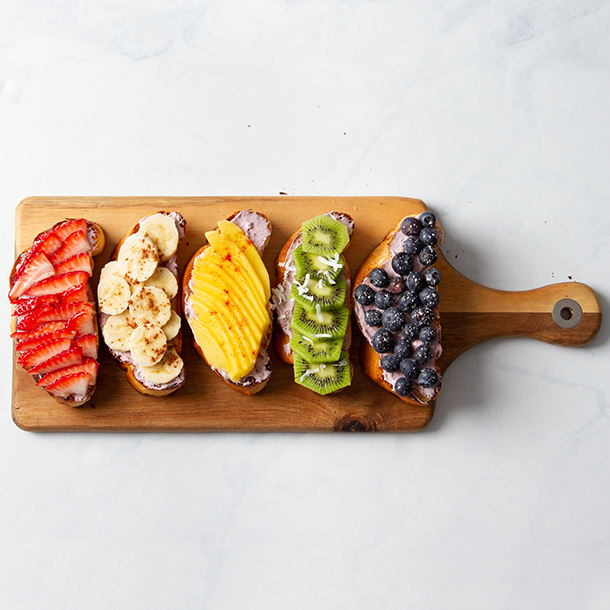 Plate your rainbow toast and take a moment to appreciate your artistry. Serve, and enjoy! Bon appetit! 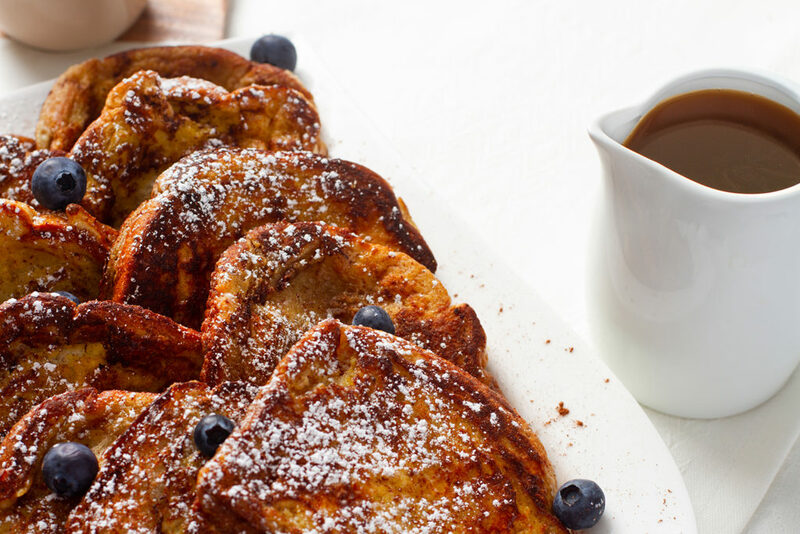 Enjoy this French toast recipe that remains the toast of the town. A classic and easy breakfast for you and the family to munch down. Heat a medium sized skillet over medium to high heat, then grease evenly with butter. Use a shallow disc to whisk together all of your ingredients, besides the bread. Mix until ingredients are completely combined. Take your bread slices and dip them into the egg mixture one by one. Be sure to soak both sides for maximum flavor. Place your soaked bread into the preheated and greased skillet. If the butter has melted, add in another cube to re-grease your pan. Cook each side of bread for a few minutes. Cook each side until it starts to reach a golden brown color. Once cooked, place your bread on a plate and add blueberries, syrup, and powdered sugar. We don’t go breakin’ hearts, we go bacon hearts! 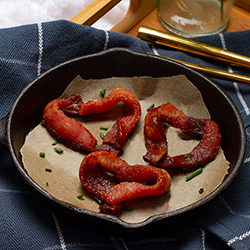 Add some TLC to this breakfast staple with these heart shaped bacon pieces. An easy and delicious way to show some love! Choose a baking sheet with edges, or line it with aluminum foil to prevent the grease from leaking. Cut your bacon slices into two halves. Use two of the cut pieces to shape them into a heart and place them on the baking sheet. If you prefer a thicker cut of bacon, fold the pieces in half long ways instead of cutting them and use those two pieces to shape a larger heart. If you’re worried about them falling apart, use toothpicks to hold the pieces together as they cook. Bake for 12 to 15 minutes, or to your desired crispness. I Love You a Brunch! ‘Tis the season to show your spouse, bae or children just how much you love them. What better way to do this than with breakfast in bed. Wake up a little early and surprise your loved ones with the best meal in the best cozy setting. 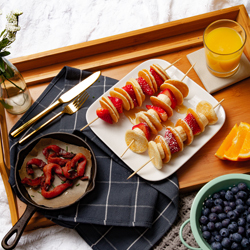 Below, you will find some delicious and simple recipes to make your breakfast in bed tray a success. 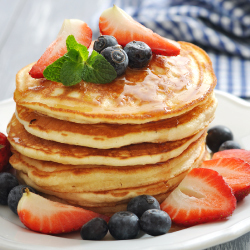 Everyone loves pancakes, it’s a simple fact of life. 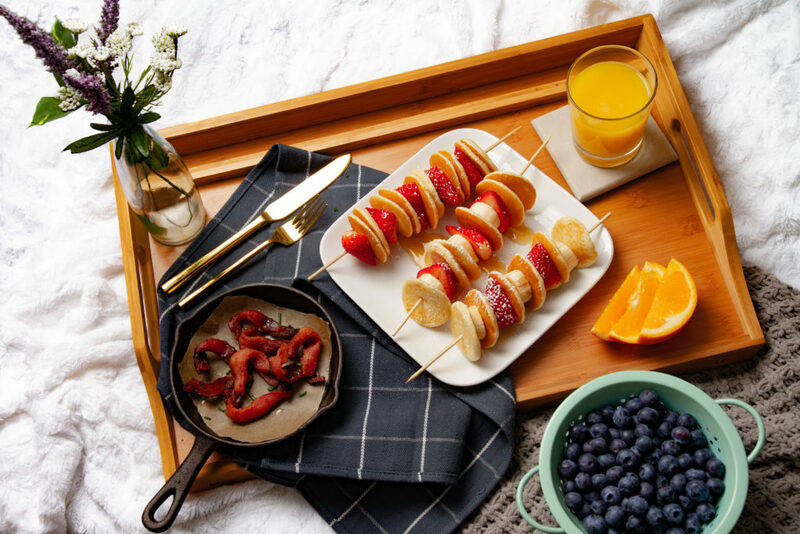 Make them easy to eat and pair them with your favorite fruit in these adorable skewers. 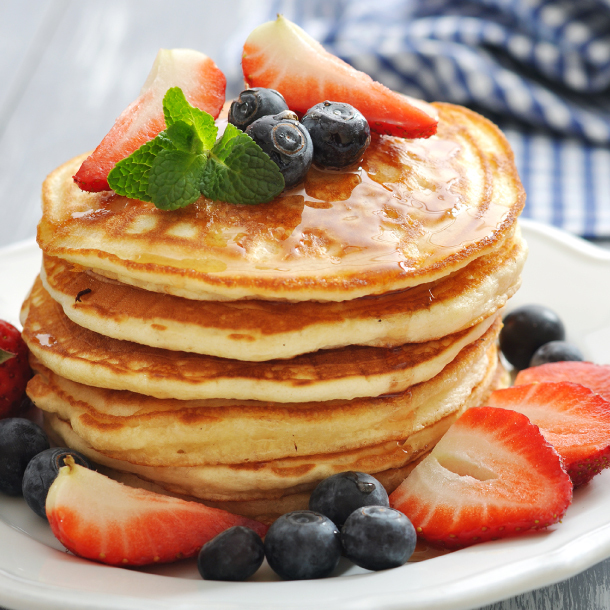 Simply heat your mini pancakes and stack the pancakes and fruit in any order. Once stacked to your liking, top with syrup, powdered sugar and anything else to compliment your skewers. 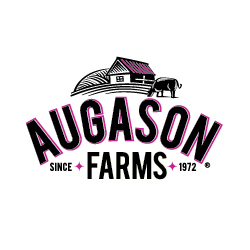 Tell someone you love them with the world’s finest meat in the shape of love! To create these, cut your bacon strip into 2 pieces, fold them over long-ways and connect in the shape of a heart. You can fry or bake these. For more detailed instructions, click the link above. With citrus being in season, take the time to freshly squeeze your favorite kind of orange juice. It will compliment your breakfast in bed perfectly. Need a quick, yummy and classic appetizer? 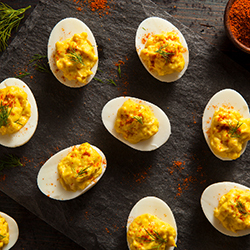 We have an egg-cellent deviled egg recipe that will knock your socks off! Slice the eggs in half lengthwise and remove yolks. Place yolks in bowl and add the rest of ingredients. Use a fork to mix together. Spoon filling into each egg half and sprinkle with paprika and garnish with dill. Enjoy! 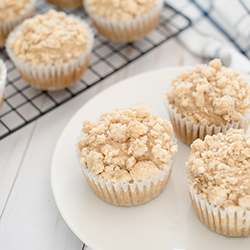 The classic banana bread muffin topped with a crunchy streusel. Preheat oven to 350 degrees F. Line two cupcake tins with liners. In medium bowl, mix together flour, baking soda, salt and cinnamon. In large bowl, whisk together the egg and brown sugar until smooth. Add vanilla, butter and bananas. Whisk until combined. Add dry ingredients and mix until combined. Add in milk and stir until combined. Set aside. To make crumb topping combine brown sugar, sugar, cinnamon, salt and melted butter in a small bowl. Whisk for a minute or two until sugars dissolve. Mix in the flour. The crumble will be dry. Use a 1/4 cup measure to fill the muffin liner with batter until about 2/3 full. Sprinkle the crumb topping on top of the batter. Bake for 16-18 minutes until slightly golden and toothpick inserted comes out clean. Let cool on cooling rack. Enjoy! 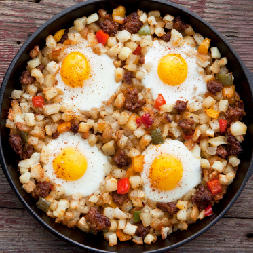 Blend your favorite southwestern flavors together for a tasty breakfast! Cut avocados and tomato into bite sized cubes. Melt butter in a non-stick frying pan. Add eggs, use spatula to fold as they cook so bottom doesn’t become hard. continue to use spatula to fold eggs until firm. Plate eggs and put Culinary Tours Corn Salsa on top. 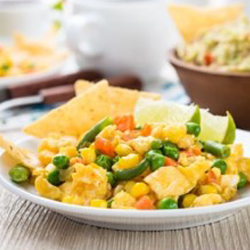 Serve with toast or tortillas!